TORRANCE, Calif.—March 18, 2014—DocMagic, Inc., the leading provider of fully-compliant loan document preparation, compliance, eSign and eDelivery solutions for the mortgage industry, announced today that its Chief Executive Officer, Dominic Iannitti, has made an exclusive list of top industry technologists. 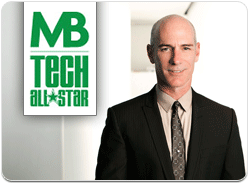 This year’s Mortgage Banking magazine Tech All-Star list only includes 8 talented executives. Iannitti founded DocMagic in 1988 when personal computers were new and business solutions that capitalized on technological tools were rare. He foresaw the day when all documents used to originate mortgage loans would be generated automatically in a fully compliant manner, provided in an electronic format and securely stored indefinitely. That goal was achieved this month when DocMagic became the first in the industry to originate an FHA mortgage with every document except the note executed in a completely electronic format.